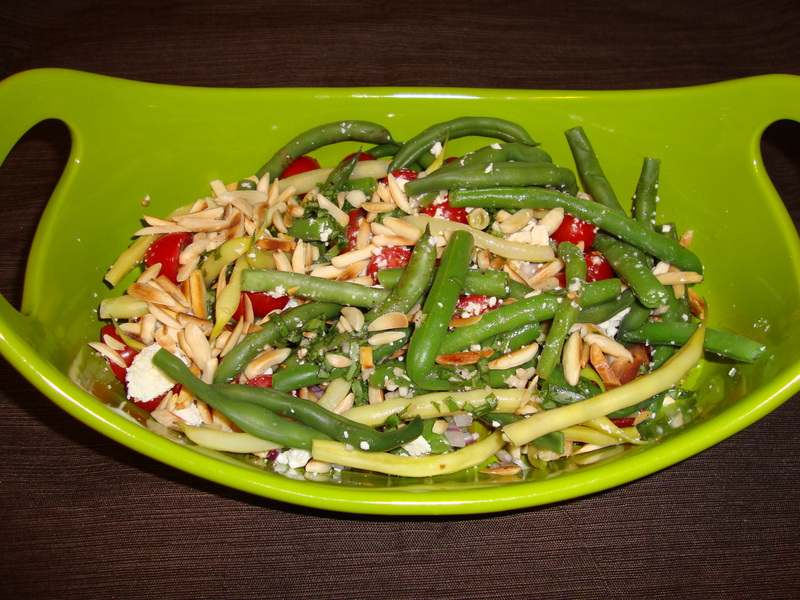 I’m all about the summer ingredients, and this salad is a great way to get in on it. Use some greenmarket cherry tomatoes, corn and arugula, and alongside some rich, creamy burrata, you’ll be in heaven. I love what the fresh basil and mint do for this salad — the recipe (from Food & Wine) calls for a generous amount of both, and it adds such an awesome array of flavor to this — so much more than you’d get from just plain lettuce (even if it IS arugula). Unfortunately I couldn’t find fava beans for this, but I bet it would make it even more interesting. If you’re not eating the salad in one sitting, don’t dress the whole thing so the greens stay fresh and crisp. To keep your basil fresh, snip off the ends and put in a glass of water on the counter. Fill a medium bowl with ice water. In a medium saucepan of salted boiling water, blanch the fava beans for 2 minutes. Drain and transfer to the ice bath to cool completely. Slip off and discard the skins. In a large skillet, heat 2 tablespoons of the oil. Add the corn and fava beans and cook over moderately high heat, stirring occasionally, just until the corn is crisp-tender, about 3 minutes. Season with salt and pepper. Transfer to a plate and let cool to room temperature. In a large bowl, whisk the vinegar with the remaining 2 tablespoons of oil. Add the arugula, tomatoes, mint, basil and the corn mixture and season with salt and pepper. Toss to coat, then spoon onto plates. Scoop the burrata into pieces and gently spoon it onto the plates. Season with pepper and serve. I’m sticking with my tomato theme this week — why limit a good thing, right? This Bon Appetit recipe for Spaghetti with Tomato and Walnut Pesto uses cherry tomatoes as a base for a non-basil related pesto — alongside walnuts, anchovies (trust me), garlic and Parmesan. I say trust me on the anchovies because people tend to feel squeamish about these little filets of flavor. And you’re right, I wouldn’t recommend eating one on its own. But these guys are the ones responsible for the great, funky undertone in food classics like Caesar salad dressing. It works the same way fish sauce works in Thai food — used sparingly, and you won’t be able to say “that’s anchovy,” but it adds depth and character. Using the tomatoes for a base makes for a pesto that’s a bit sweeter than what you’re probably used to, but it’s totally delicious and rich and I couldn’t stop eating it. And while the pesto doesn’t have basil involved, basil is added at the end of this dish in full leaf form, so you still get that great basil flavor, which cuts through the rest of the tastes beautifully. Rather than toast the walnuts in the oven, I did it on the stovetop in a dry skillet — easier and you don’t have to heat up the whole oven. When you buy basil, cut off the bottom of the sprigs and put it in a glass of water on your countertop. I can’t tell you how many bunches of basil I’ve had go bad in one day in the fridge despite my best efforts. This is the way to go — and if you get really fresh basil, it will last a long time — mine lasted two weeks! Pulse anchovies, garlic, lemon zest, red pepper flakes, and ½ oz. Parmesan in a food processor until finely ground. Add walnuts and half of tomatoes, then, with motor running, stream in ⅓ cup oil; process just until combined. Season with salt. Transfer pesto to a large bowl and stir in black pepper. Do Ahead: Pesto can be made 1 day ahead. Cover and chill. It’s my favorite food time of year…tomato season. What is better than a super fresh, sweet, tasty heirloom tomato right from the garden? One of my favorite things ever! This awesome salad that I spotted in Food & Wine takes advantage of tomato season and matches them up with fresh ricotta seasoned with lemon zest and sunflower sprouts, and an unconventional topping — granola. It’s so simple but so delicious! The granola incorporates pistachios and sunflower seeds and adds such a nice crunch to the salad. It makes a lot, so you’ll have plenty to throw on some yogurt with some berries for a nice week or so of breakfasts. And the other interesting ingredient — sunflower sprouts. They’re sweet, crunchy and fresh, and add a nice green splash to an already beautiful plate. Make this and stat while the tomatoes are in their prime! Do not skimp on the tomatoes. If you can’t get them fresh at the farmer’s market, don’t bother. Heirloom — even better. Same with the fresh ricotta — must be fresh! You’ll find it at a good grocery store in the cheese section. Don’t you dare use the stuff in plastic tubs in the dairy aisle. Sunflower sprouts won’t be easy to find. I nabbed them at the Union Square greenmarket. Preheat the oven to 325° and line a large rimmed baking sheet with parchment paper. In a large bowl, toss the oats with the agave, water, 1/4 cup of olive oil and 1 teaspoon of salt until the oats are thoroughly coated. Spread the oats on the prepared baking sheet and bake for about 25 minutes, stirring twice, until the granola is light golden. Stir in the pistachios and sunflower seeds and bake for about 10 minutes longer, until golden brown and dry. Let the granola cool on the baking sheet, stirring occasionally. In a medium bowl, mix the ricotta with the lemon zest, 1 tablespoon of the lemon juice and 2 tablespoons of the olive oil. Season with salt and pepper. In another medium bowl, toss the sunflower sprouts with the remaining 1 tablespoon each of olive oil and lemon juice and season with salt and pepper. Arrange the tomato wedges in shallow bowls and season with salt and pepper. Spoon the ricotta around the tomatoes. Scatter the sprouts on top and sprinkle with some of the granola; save the remaining granola for another use. Serve right away. It’s been a rainy few days in San Diego, which doesn’t happen too often. I won’t complain, though — the variety is nice, actually — and regardless, it’s the perfect weather for a nice, warm bowl of soup, which I took advantage of with this awesome pappa al pomodoro. 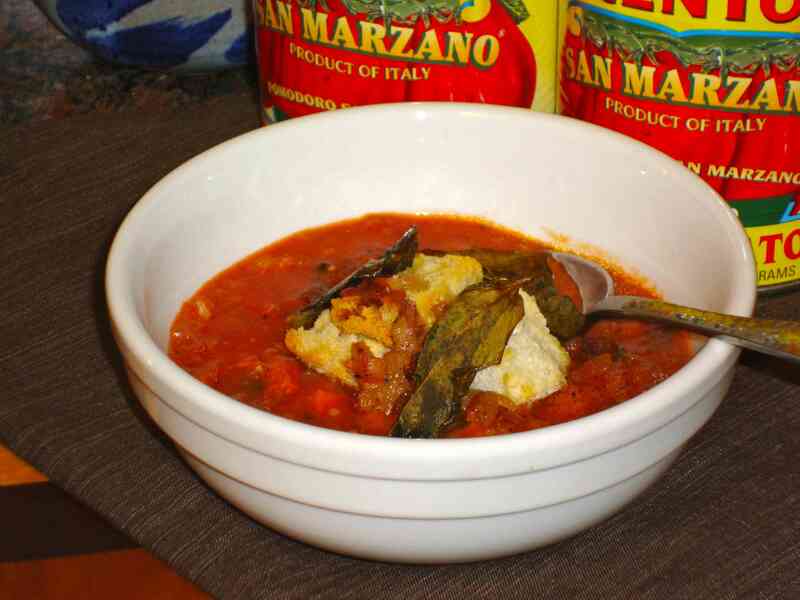 This is a classic Italian recipe — Tuscan to be exact — and was traditionally a way to get rid of that stale bread Italians tend to have hanging around. As you can expect from a classic Italian dish, the flavors are simple but delicious. You’ve got ripe tomatoes (in this case canned San Marzano), onion, carrot, garlic, fennel, basil and red wine, all mixed in with cubes of bread that break down and thicken it up a bit. This version by Barefoot Contessa incorporates a topping that absolutely nailed it for me — toasted bread (basically fresh croutons), pancetta and basil leaves baked in a hot oven and then sprinkled on top. It’s a great crunch with salt from the pancetta and the crispy basil leaves. Awesome. I made this with some of the homemade chicken stock I made the other day, which really made a big difference. It’s so nice to be able to control the salt, and I barely had to add any to this! It was so warm and hearty, and the perfect thing for a rainy night. Serve with a salad or a baguette. 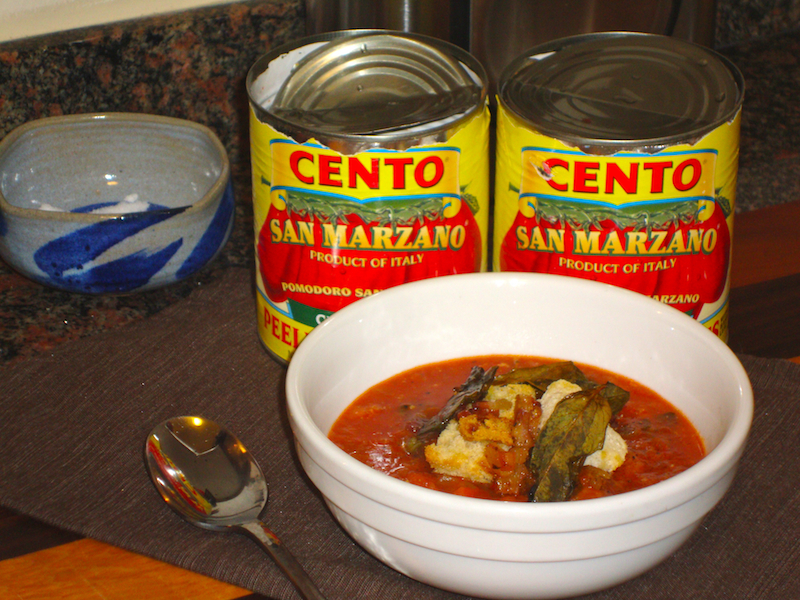 I splurged on San Marzano tomatoes instead of the regular or store brand. I have to say, it was awesome and much sweeter than you would get from the run-of-the-mill brand. I highly recommend pancetta for the topping — bacon as a replacement just won’t cut it. Barefoot Contessa calls for whisking this before serving — personally, I wasn’t a big fan, particularly of the chunks of carrot. So, I just stuck it in the food processor and smoothed it out a bit. Perfect. This makes a lot — as usual, I froze some, which will definitely take me through at least six more servings. I’m not the biggest green salad fan (BO-ring) so I’m always on the lookout for interesting slash delicious ways to get my veg on. Don’t get me wrong — I like a great green salad now and then, but it’s just not my go-to, and if I DO go there, I need a lot of more interesting components (that means more than lettuce, tomato and cucumber, people. Yawn. ), and dressing made from scratch (obviously). 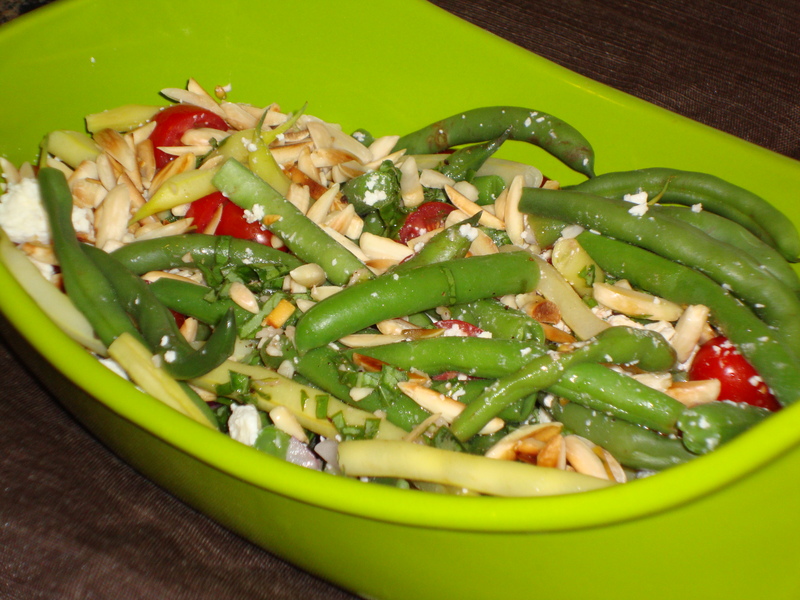 Anyway, this Green Bean Salad by Jamie Deen is pretty awesome — it’s got great acidity from the red wine vinegar, plus almonds for some crunch and some tangy feta…literally could make it a meal, it’s that good. I made this for a side with Couscous Stuffed Chicken Breast with Feta, Sun-dried Tomatoes and Kalamata Olives, but it would be a perfect summer cookout recipe, or a great bring-something-to-a-friend’s-house dish since you don’t need it to be warm and it’s even better once everything marinates for a little while. I used some awesome farmers market beans for this — both green, purple and yellow (though the purple ones lost their cool color in the cooking process…boo). I’ve only got one tip: cut the green beans into one-inch pieces once you’ve cooked and cooled them — much easier to eat. And use the best, freshest beans you can find.